The first (black and white) photograph shows Colonial Hall on Union Turnpike shortly before beginning the excavation that would create the canyon called the Interboro Parkway (today's Jackie Robinson Parkway). It is one of the few photographs I know of that show what Union Turnpike was like before the cut. 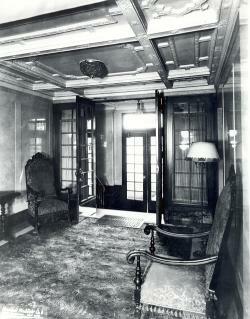 The second black and white photograph shows the lobby of Colonial Hall at this same time. If anyone has access to the lobby of Colonial Hall and can send me a photograph of what it looks like today, I will post it here. 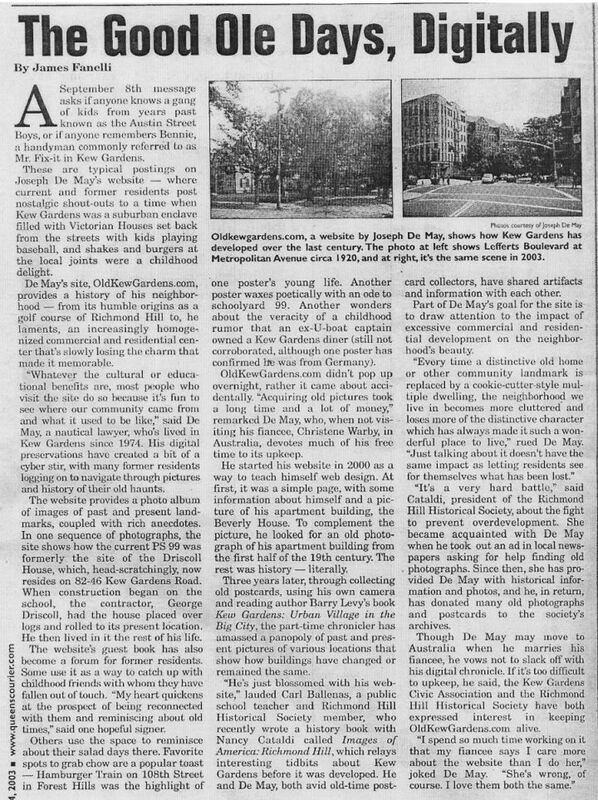 Editor's Note: Thanks to the New York Daily News newspaper for permission to reprint a recent article by Michael Perlman of Forest Hills about the landmarking (or lack of landmarking) of historic sites in Queens. Editor's Note: Thanks to Nancy Cataldi for this black and white photograph showing the beginning of construction of the Center at Maple Grove Cemetery at the end of the South Border near Kew Gardens Road. The Center should be open by next year and will include a community center and an archivial museum. Just wanted to let everyone who remembers Vinny Richards and Frank Goldberg that we had lunch today in sunny Boca Raton where I live. Frank was on a trip to see his 95 year old dad who is single and looking.We enjoyed the food but it wasn’t the Homestead that’s for sure. HEY EVERYONE!!! Come march with the Richmond Hill Historical Society on Sunday, May 28 at 12 pm down Metropolitan Avenue ... bring your kids, friends and family!!! Meet us at Ascan Avenue and Metropolitan about a quarter to 12!! Hope to see you!!! That's close Al. My all time favorite at the Homestead Deli was their rare roast beef on thin sliced double baked rye with real ‘homemade’ fresh crunchy coleslaw. That and a Dr Brown's celery soda. Wow. I've lived in Kew Gardens since July 1, 1979 to the present. I found your Web Site from the Kew Gardens Civic Assn. Bookmark Card. My house was built in 1925. I think it would be a good idea to have Kew Gardens Landmarked. It would be very good for Kew Gardens as a whole community. It's O.K. to have my e-mail published. In part I of my ‘stroll’ series (Random Recollections) my time machine hurls us back to the 1940’s – 50’s where we tour the establishments along the westerly side of Lefferts Boulevard between 83rd. and Beverly. I will once again turn the clock back to that same era as we continue our walk on the more easterly side of the ‘ponte vecchio’ (bridge) between Austin Street and Cuthbert Road. [Click here to read the rest of the story and view the images. Editor's Note: The current edition of the "Queens Chronicle" newspaper has an article about attempts to repair and restore the Statue of Civic Virtue on Queens Boulevard by Borough Hall. You can read the online version by clicking on the link below. Editor's Note: Today's edition of the "AM New York" newspaper has an article profiling Kew Gardens. You can read the online version by clicking on the link below. i am in the class of 1956 class 6-1 picture. i am sitting on the left side at the end of the row. I am lawrence kessler. to contact me my email address is drlarry10022@yahoo.com. i would love to hear from all old friends. Editor's Note: I have created a Kitty Genovese Message Board which is where all messages about the Kitty Genovese case will be posted. Such messages will no longer appear in the Guestbook. I have gone through the Guestbook archives and transferred all past messages about the case to the new message board. Updates to the Kitty Genovese Message Board will be noted in the Quick Links above for those who would like to read them. Editor's Note: If you are planning a planning a class reunion or similar large scale event for a school or other organization in Kew Gardens or Richmond Hill, you can have a web page here, absolutely free of charge, dedicated to providing information about it. The page can include whatever content you want - the names of people attending, driving directions, the date, time and place of the gathering, photographs, etc. You supply the content and I will do the page for you and update it as often as you want. I will put links to the page here in the guestbook and on the home page. I have already done such a page for the Holy Child Jesus Class of '63 Reunion. Email me with any questions. I was floored when I saw the houses on the KG site. I can/t believe that homes like that are in KG. They are outstanding. I does hurt though to think that the older homes that we remember may be gone to make way for the new but that happens everywhere in this day and age. We still have fond memories of the old neighborhood and that will stay in out hearts and minds forever. I have been on this site since the beginning and am proud to call KG my roots. BRAVO ! to Mr. Joe DeMay...for a fabulous presentation at the Kew Gardens Civic Association's Annual Meeting on May 2, 2006. It was so wonderfully put together and was a pleasure to watch. I did not want it to end! Kudos to a wonderful job. His love for Kew Gardens shines through! Thanks again! It was great! first of all thanks for a great site. i have been spellbound for the last 3 hours looking at it. i grew up in KG between 1946 and 1969. i probably have a lot of pictures and will try to scan some and send you. 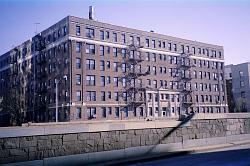 i didn't go to PS 99 because i went to yeshiva in forest hills but my sister went to kindergarten there. i lived in dale gardens till i got married in 69 (and moved to israel) and was surprised that there is almost no mention of dale gardens ( i found 2 pictures). it was one of the most unique housing developments and i have ever seen and it was a great place to raise kids (and be raised). we all new you could not go outside of "the gardens" without a grown-up and therefore you could not get run over. it is definitely worth more research. every time i go to the states i make a point of visiting there - it realy hasn't changed much - and maybe one day i will get up the nerve to knock on my own door (hopefully with one of my children and/or grandchildren) to check out the place. Just to let you know that the next music and poetry (and comedy) night will be held on Thursday, May 18th at the Theater Cafe, 106-03 Metropoitan Avenue in Forest Hills beginning at 7:30 P.M. I have perused the new Kew Gardens Civic Association website that, from what you have told me, you helped to create. Actually, you didn't have to tell me because the site design and presentation both very obviously reflect your capable talents in this area - great job! (as usual). I did notice (in a reprint of a Forest Hills - Kew Gardens Post piece -10/10/41) that the first meeting of the Association was held at the home of a Mr. Cook in 1914. The 'premier' real estate broker of the era in Kew Gardens was a fellow by the name of Charles Cook who sold my parents their property on 83rd. 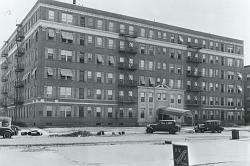 Avenue in 1937. I'm wondering whether this might be the same 'Mr. Cook' referred to in the article. Again, great job and my thanks for all the memories. On September 15 & 16,^ 2006 there will be a 50^th class reunion of the exceptional 1956 Richmond Hill High School graduation class!! Carol Drescher Koenig, our class president, has been working with her committee to organize local arrangements, and I have attempted to locate and communicate with long-lost fellow graduates. Our philosophy for the reunion is to provide a convivial environment for which people separated by a half century can talk with friends, lovers, classmates, et cetera, who by happenstance shared four formative years during our youth. We wish to foster a place where returning classmates can meet, talk, reminisce, and remember how things were (or should have been). During those precious hours together, I expect that addresses will be exchanged, life experiences discussed, and arrangements made for future visits by people too long separated by time and distance. One also might expect the joys, and some melancholy, associated with homecomings. I am personally excited by the prospects of seeing and communicating with people I have thought about over the years, but had little realistic hope of ever seeing them again. Now I am just weeks away from seeing some of those folks. I understand that some high school reunions feature a country club ambience, with golf outings, 5 K walks and runs, festivities in five-star hotels with five-star costs, but our reunion will be lower key by design, and will provide attendees an opportunity to talk and associate without many distractions. Although plans are still developing for Friday evening gathering, we have arranged to have a tour of the high school building on Saturday morning and a meeting with an administrator. There will be a buffet dinner and cash bar on Saturday evening with a brief formal program. Most of the evening will be unstructured to allow for a half century of “catching up” in the short time we will have together. 3. the _names, email, and addresses of any R.H.H.S. classmates known_ _ to you_ (we want to invite them if you have not already done so). We want as large a group of enthusiastic returning classmates as possible, but we are obliged to plan with the number of people who can decide now. We will strive to be flexible if classmates come forward later, but we must start making the definite arrangements at this time. For attendees, the other associated personal costs will be your hotel and travel expenses. We will have specific hotel recommendations later, but for planning purposes, the cost of hotel will be about $140/night. We will attempt to negotiate better rates as our committed numbers take shape. Thank you for understanding that we are arranging a reunion for all and we depend on the cooperation from returning classmates. Timing for us has become critical, and your commitment now is important. Thank you for understanding and for sending your check today. Please raid the attic or basement for R.H.H.S. memorabilia (local newspaper stories, pennants, year books, etc. and high school era photographs for a planned display. It will be a splendid two days in September! !